Heat oven to 325°F. Grease bottom and sides of 12-cup fluted tube cake pan or 10-inch angel food (tube) cake pan with shortening; lightly flour. In large bowl, beat all ingredients except powdered sugar with electric mixer on low speed 30 seconds, scraping bowl constantly. Beat on medium speed 2 minutes, scraping bowl occasionally. Pour into pan. Bake 1 hour 25 minutes to 1 hour 30 minutes or until toothpick inserted in center comes out clean. Cool 20 minutes; remove from pan to wire rack. Cool completely, about 1 hour. Sprinkle with powdered sugar. 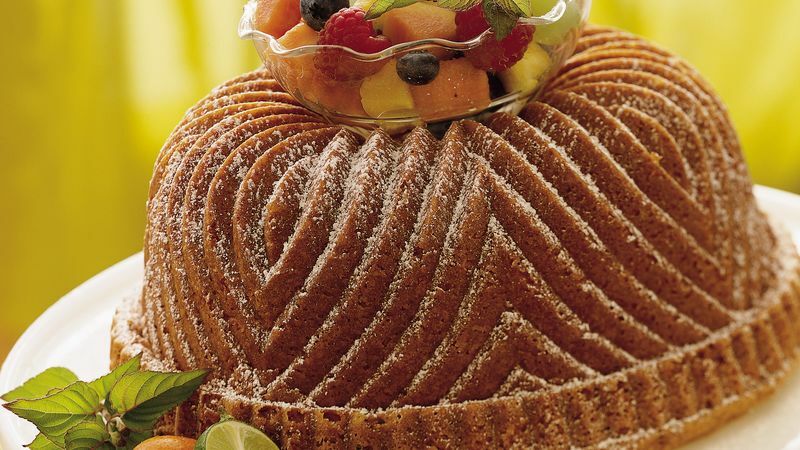 Freeze an unfrosted pound cake, tightly wrapped, up to 3 months. Fresh fruit is the perfect accompaniment to this dressy dessert.